One day you glance in the mirror and notice your legs and thighs aren’t what they used to be. You see the bumpy, uneven appearance and think, is this cellulite, what is it? Cellulite is subcutaneous fat causing dimpling of the skin. Its appearance is uneven, bumpy skin. Some people say it looks like an orange peel or cottage cheese. 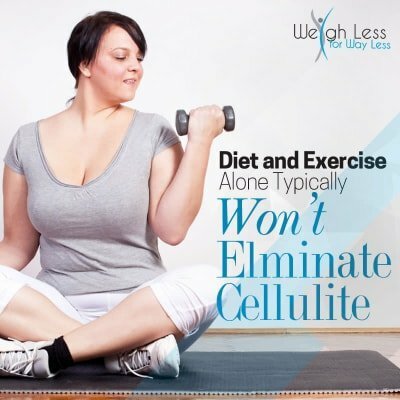 Cellulite generally affects the thighs, buttocks and lower abdomen. The direct cause is unknown, however it is commonly linked to an interaction between the connective tissue and the dermatological layer below the surface of the skin. Factors like heredity, thickness of the skin, gender, and the way your body distributes fat can all factor into the appearance of cellulite. This condition is more common in women than men. Other key factors that play a role in cellulite are hormones and age. Hormones such as estrogen, insulin, thyroid, and prolactin all have effect cellulite. Studies have concluded that as estrogen production in women decrease over time the flow to the connective tissue under the skin decreases. Lower circulation results in less oxygen to the area (thighs, buttocks, and abdomen). This unfortunately means less collagen production which enlarges fat cells. Treating cellulite at home can be difficult. Studies have shown that diet and exercise help reduce the appearance, but does not completely eliminate the problem. If your diet is full of fat, carbohydrates, and salt, you are more likely to have greater amounts of cellulite. Those who lack daily exercise are more prone as well. Consequently, those in professions that require long periods of standing daily, are at greater risk. Taking frequent breaks and staying well hydrated can help. Changing your dietary and exercise habits can reduce your body fat thus reducing the appearance of cellulite, but major changes are needed in order to eliminate the problem. If diet and exercise do not eliminate the problem, then what does? 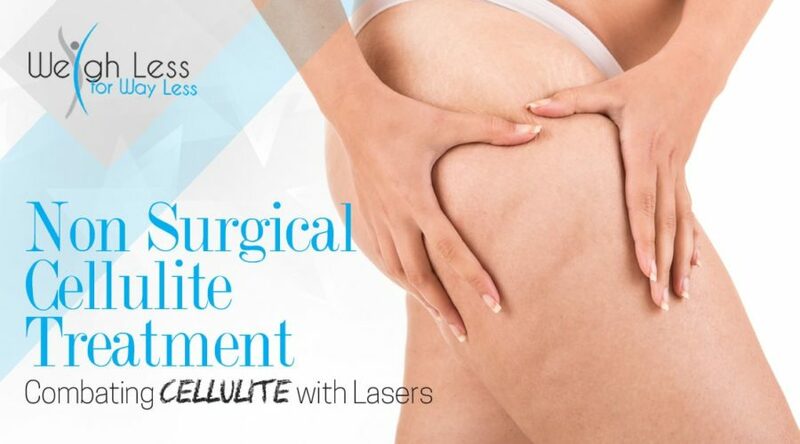 According to the American Academy of Dermatology (AAD), studies have shown many techniques and treatments can help cellulite by breaking down the bands of connective tissue underneath the skins surface. One of the best ways to do this is through laser treatment. Some of the most effective treatments for cellulite are done through the use of lasers. There are a variety of types of lasers that can be used. Laser treatments use tiny laser fibers that insert beneath the skin. Once active, the laser then breaks up the tissue. As this happens, collagen production increases and thickens the skin. Weigh Less for Way Less uses the latest Verju Laser System by Erchonia to reduce cellulite. This technology is FDA cleared and uses a low-level laser that targets pockets of uneven fat in the common problem areas such as the thighs, buttocks, and lower abdomen. Through 30 minute nonsurgical cellulite treatment sessions, we will target your problem areas. Number of sessions may vary based on the extent of cellulite. 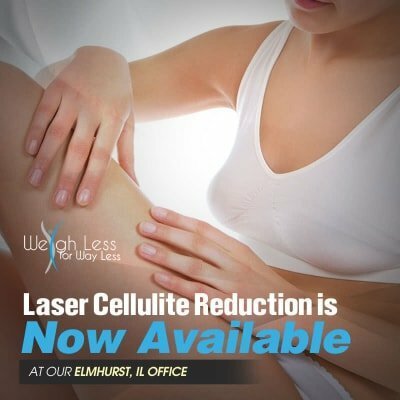 We invite you to learn more about non invasive cellulite treatment through a free consultation at our Elmhurst, IL Weight Less for Way Less weight loss clinic. Contact us today and get one step closer to loving your skin again. Have a?question about?Non Surgical Cellulite Treatment? Join us in the comments! ?